Prayerfully Consider Partnering with Us. Welcome to our bookstore where you will find resources to help you in your life journey into a deeper and more intimate relationship with Jesus Christ. 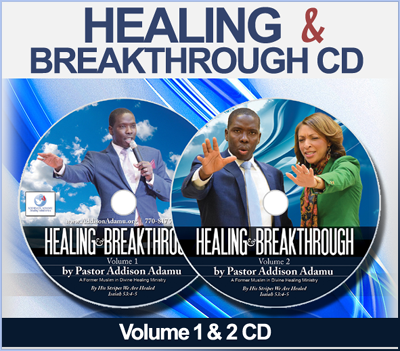 Addison Adamu Healing Ministry is an international healing ministry with a passion for worldwide evangelism and healing crusades. Its world headquarters is located in Atlanta, Georgia in the United States of America. Evangelist Addison Adamu birthed this ministry out of personal and supernatural encounters with Jesus Christ at the tender age of 16, while in his native country of Ghana, West Africa. He miraculously converted from Islam to Christianity through healing miracles, serial visions and dreams from Jesus, The Son of The Most High God. Being the first person to convert from Islam to Christianity in his family since creation, he went through severe persecution in a Muslim village at the hand of his own father and Muslim clerics. Through it all Jesus protected him supernaturally. The Bible says an angel of the Lord encamps around those who fear Him and he delivers them (see Psalm 34:7). God used him to heal his dying father from an unknown ailment that doctors could not cure or diagnose just a few short weeks after Addison became a Christian. As a result, half of his family and the entire Muslim village came to the saving knowledge of Jesus Christ. 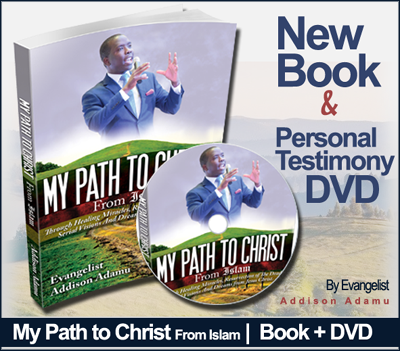 Read Addison's life changing new book My Path To Christ From Islam and your life will never be the same. You will see God’s transformation power and how He took an ordinary simple boy from a tribal village in Ghana Africa, transformed his life, and gave him an international platform on radio and television in America changing lives for the Kingdom of God and healing the sick in Jesus’ Name. You will read mind-blowing stories about him growing up in a Muslim home without food, shoes, clothing, his visit to heaven, and how he ended up in America. 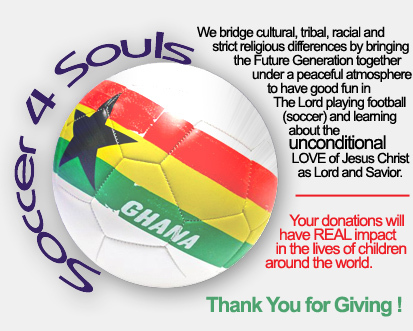 Soccer4Souls is a non profit Christian soccer Ministry winning children and the youth in Ghana, Africa for Jesus through number one sport in the world, football. We bridge cultural, tribal, racial and strict religious differences by bringing the Future Generation together under a peaceful atmosphere to have good fun in The Lord playing football (soccer) and learning about the unconditional LOVE of Jesus Christ as Lord and Savior. Through the sport of football (soccer) Evangelist Addison Adamu heard about Jesus for the first time as a Muslim boy from a teammate in high school and that eventually led to his miraculous conversion from Islam when he was 16, after attending a healing crusade in Ghana. The Lord spoke to his heart to start this ministry to win thousands of Addison’s there in Ghana, Africa and around the world. Without soccer Addison may not have ever come to the saving knowledge of Jesus. Soccer4Souls Ministries provides free soccer balls, cleats, jerseys, Bibles, food, clothing, shoes, as well as a modern day artificial grass field for both boys and girls to play and develop their God-given soccer talents and skills for the glory of Jesus Christ. Get involved and be a part of this big vision as a volunteer or a partner. Your one time or monthly donations will help us win precious children and you in Africa and give them hope in Jesus. $100 will buy soccer ball, a pair of cleats and feed a child for 30 days. $200 or more will buy soccer balls, a pair of cleats, a Jersey and feed many children for 30 days for free. Prayerfully consider making a donation today and put a smile on a child’s face. Your name and favorite scriptures will be written on the soccer balls. That child will lay hands on that soccer ball and pray for you daily.